Oral cancer in the young with no tobacco exposure: A distinct epidemiological subset? Oral squamous cell carcinoma (OSCC) contributes significantly to the global cancer burden, with an estimated annual incidence of 300,000 cases. The predominant causative factor associated with these cancers has been the use of tobacco; it has been estimated that tobacco use in conjunction with alcohol abuse and poor diet is responsible for over 90% of all cases. The incidence of OSCC occurring in patients with no history of tobacco exposure has been low; literature reports it anywhere between 5% and 13%, with a majority of these patients having no demonstrable risk factor for carcinogenesis. OSCC has been typically described as a disease afflicting those between the fifth and eighth decades of life. With no standardized definition for “young,” various arbitrary cutoffs have been used, such as 30 years, 40 years, and 45 years. The incidence of OSCC in the young has been quoted as 1%–8%, but recent studies have shown an increase in incidence by up to 60%. This has been attributed to genetic alterations and the incidence of human papillomavirus infections; however, no conclusive evidence exists to support these claims. OSCC in the young with no history of tobacco use is a rare occurrence in literature. Assumed to have an underlying genetic component, very little is known on outcomes and prognostic determinants in this cohort of patients. To describe this cohort, we studied the characteristics of all patients below 45 years with no history of tobacco use treated at our institution during a 10-year period to ascertain oncological outcomes and their determinants. From a prospectively maintained database of nearly 700 patients treated at our institution, we identified 82 patients of OSCC (tongue and buccal mucosa) below 45 years of age with no history of previous or current tobacco exposure (smoking, chewing tobacco, snuff, or other forms) treated between 2004 and 2014. Patients with any previous history of tobacco use, irrespective of quantity, were excluded from the study. No other known predisposing factors for malignancy were noted (chronic dental trauma, immunosuppressive medications, alcohol abuse, etc.). All staging were as per the American Joint Committee on Cancer (AJCC) 8th edition. Only patients who underwent surgical resection with curative intent in our institution were included in our analysis. All patients were treated with a wide excision of the tongue lesion (a gross margin of 1–1.5 cm aiming for a minimum microscopic margin of 5 mm) and ipsilateral selective neck dissection, with appropriate reconstruction. Contralateral neck dissection was performed for clinically or radiologically positive nodes, lesions crossing the midline, or lesions with extensive floor of mouth involvement. Adjuvant radiotherapy was administered for advanced stage (III/IV), any nodal disease, or more than one adverse pathological feature (perineural invasion [PNI], lymphovascular invasion [LVI], or poor differentiation). Adjuvant chemoradiotherapy was administered for positive/close margins or extranodal extension (ENE). Clinical and pathological information for these patients was extracted. Recurrent disease was defined as any proven local, regional, or distant disease occurring at least 3 months after the completion of treatment. Overall survival (OS) was defined as time from initial surgery to date of death or last follow-up evaluation. Statistical analysis was performed using SPSS version 20 (IBM, New York, USA) and Microsoft Excel version 2010 (Microsoft, Redmond, WA, USA). The endpoints for analysis were OS, disease-free survival (DFS), local recurrence-free survival (LRFS), nodal RFS (NRFS), and distant RFS (DRFS). 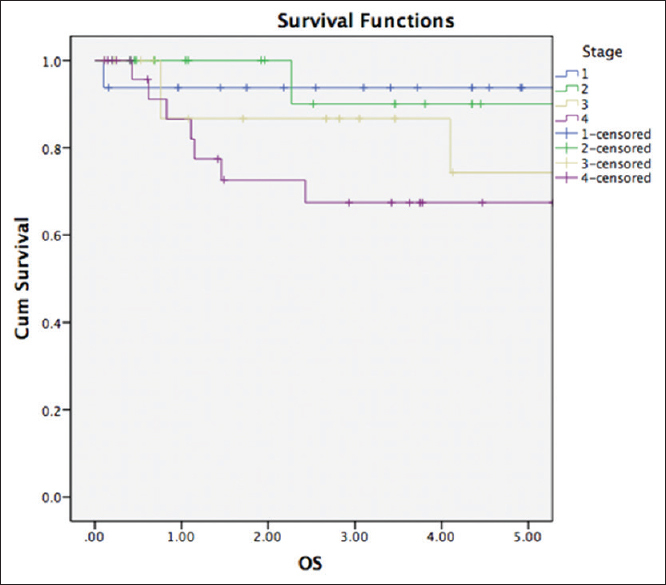 Survival curves were generated using the Kaplan–Meier method and log rank test. Multivariable analysis was performed using the Cox proportional hazards model. All statistics were two sided, and P < 0.05 was considered statistically significant. A total of 82 patients were included in our analysis, with a median follow-up of 31 months (range: 6–108 months). The median age was 40 years (range: 17–44 years). A majority of the patients (67%) were males [Table 1]. The subsite was predominantly oral tongue (80%), with the remainder being buccal mucosa. pT3 was the most common T-stage (39%), followed by pT2 (30%). pT4a was rare (10%), and all of these were buccal cancers with cortical invasion of the lower alveolus. Majority of the patients were pN0 (57%), followed by pN2a (29%). Of the 35 node-positive patients, 24 (69%) had ENE. LVI was noted in 27 (33%) and PNI was noted in 33 (40%) patients. Moderate or poor differentiation was noted in 42 (51%) patients. Majority received surgery alone (59%), followed by surgery with adjuvant chemoradiotherapy (29%) and surgery with adjuvant radiotherapy (12%). The most common TNM stage was III (38%), followed by II (24%). Five-year OS based on stage was 97% for Stage I, 95% for Stage II, 75% for Stage III, and 64% for Stage IV [Figure 1]. On univariate analysis, the factors found to impact OS were nodal status (P = 0.02), ENE (P = 0.003), and PNI (P = 0.003). Method of treatment was also observed to correlate with survival, reflecting the adverse features associated with adjuvant therapy administration (P = 1.007). Five-year DFS based on stage was 84% for Stage I, 79% for Stage II, 57% for Stage III, and 59% for Stage IV. On univariate analysis, only PNI was found to strongly impact DFS (P < 0.001). 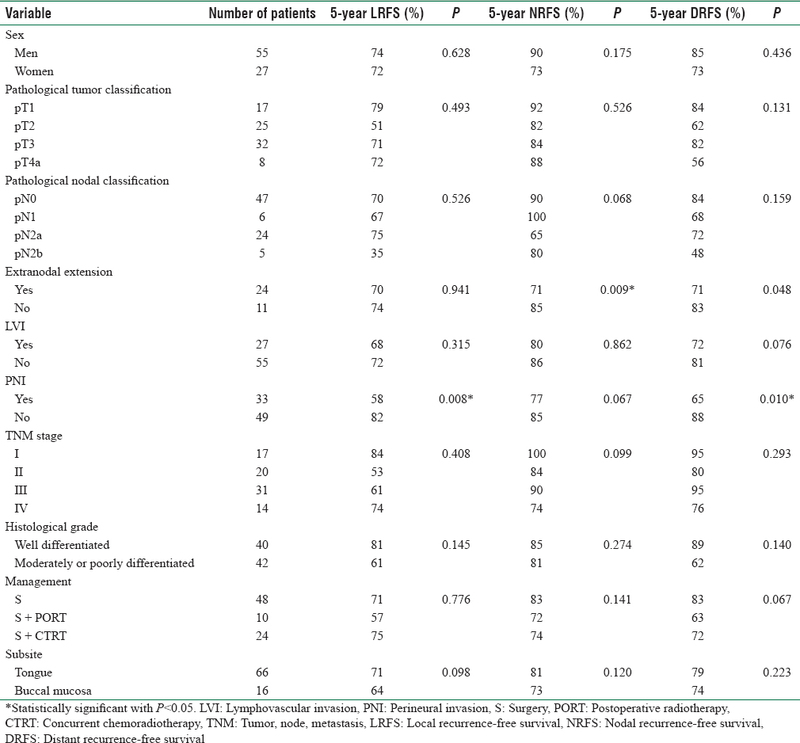 To identify the patterns of failure in this cohort and their clinical course, we considered the determinants of LRFS, NRFS, and DRFS [Table 2]. On univariate analysis, PNI was a predictor of LRFS (P = 0.008) and DRFS (P = 0.010), and ENE was a predictor of NRFS (P = 0.009) and DRFS (P = 0.048). 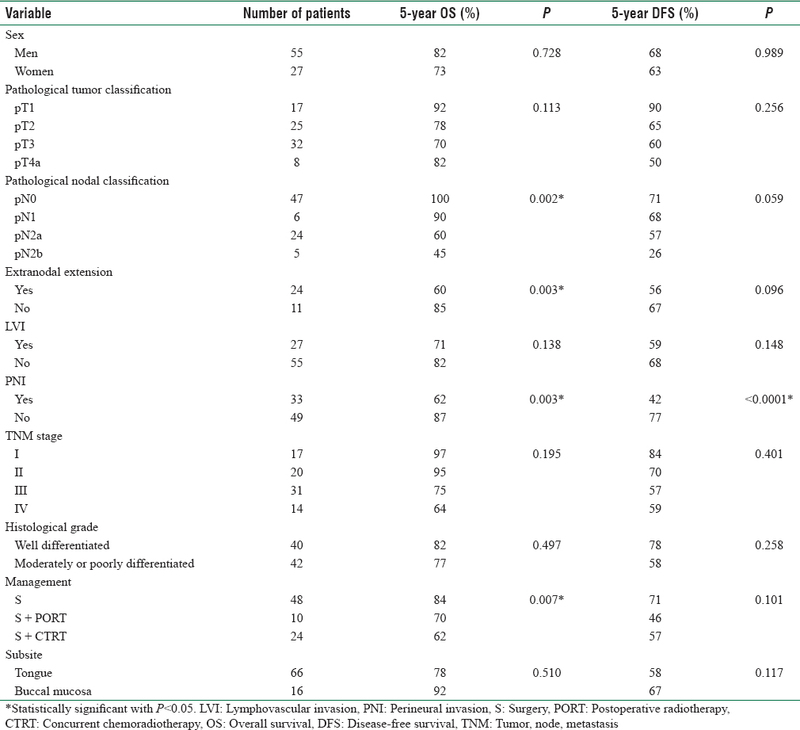 On multivariate analysis, no factors were found to be significant for OS, whereas for DFS, PNI was found to be statistically significant (P = 0.002, hazard ratio [HR]: 2.4, 95% confidence interval [CI]: 0.08–0.566) [Table 3] and [Figure 2]. For LRFS, PNI was statistically significant (P = 0.006, HR: 1.3, 95% CI: 0.57–1.23); for NRFS, ENE was statistically significant (P = 0.045, HR: 1.85, 95% CI: 0.775–1.175); and for DRFS, PNI was statistically significant (P = 0.048, HR: 1.8, 95% CI: 0.39–1.83) [Table 4]. OSCC in the young with no history of tobacco use is a rare entity;, it is estimated that over 90% of OSCC is associated with self-reported tobacco use., The role of tobacco exposure in OSCC in the young is controversial; some hypothesize that the exposure to carcinogens is of insufficient duration to warrant malignant transformation, suggesting that young users of tobacco with OSCC have a genetic predisposition or that carcinogen exposure at a younger age has a more profound impact on malignant transformation., It has also been shown that younger patients have an altered metabolism of carcinogens and pro-carcinogens, supporting the theory that OSCC in the young may be biologically distinct from that in the elderly. However, literature still remains divided, with some authors suggesting that OSCC in the young represents more biologically aggressive disease,,, with the majority of authors having concluded that younger patients have similar or improved outcomes when compared to their older counterparts.,,,, Given that tobacco exposure may have an altered effect on younger patients, it was our intention in this study to evaluate if younger patients of OSCC with no tobacco exposure had favorable outcomes. The survival outcomes in this cohort were excellent: for TNM Stages I, II, III, and IV, the 5-year OS was 97%, 95%, 75%, and 64% and the 5-year DFS was 84%, 79%, 57%, and 59%, respectively. On comparison, the OS in OSCC for Stages I–IV in a large series had been reported to be in the range of 85%, 75%, 60%, and 50%, respectively.,, Pathological T-stage was not found to be a predictor of OS or DFS. This may be because our patients of pT4a had uncharacteristically good outcomes, with an OS of 82% and a DFS of 50%. This most likely reflects a previously described anomaly in the AJCC staging, where tumors with bone invasion (pT4a) having a diameter of 4 cm or less have outcomes similar to pT2 tumors; all the eight pT4a patients in our cohort had buccal cancers with a diameter of 4 cm or less, having cortical mandible invasion. The subsite of OSCC involved was predominantly oral tongue (81%), with buccal cancers forming the remainder. We had no young patients without tobacco exposure having alveolus or floor of mouth as the involved subsite in our database of nearly 700 patients. Interestingly, these subsites were involved only in elderly patients with or without tobacco exposure. This concurs with other literatures which show the oral tongue as the most commonly involved subsite in patients of OSCC having no tobacco exposure, followed by buccal cancers. This is potentially relevant as some of the potential causative factors associated with OSCC in the absence of tobacco include poor dental hygiene, chronic trauma from sharp teeth or ill-fitting dentures, human papillomavirus,, and chemical exposure,, which may impact OSCC subsites differently. The role of PNI on locoregional control and survival was profound. PNI was found to impact DFS and local and distant recurrences on multivariate analysis. The 5-year DFS in patients without PNI was 77% compared to 42% in those with PNI, suggesting that these patients require treatment escalation when possible and that PNI may help better prognosticate patients in this cohort. Whether PNI is a marker of biological disease aggression in these patients is a potential area of future study. ENE was common in this cohort, with 68% of patients with nodal disease having ENE. All patients with ENE in our cohort received adjuvant chemoradiotherapy. Surprisingly, the patients with ENE in our cohort had good survival outcomes (5-year OS and DFS of 60% and 56%, respectively) when compared with contemporary literature, showing an OS of 45% or less.,, ENE was a significant predictor of OS, NRFS, and DRFS on univariate analysis and of NRFS on multivariate analysis in our cohort; however, when treated with appropriate adjuvant therapy, still had acceptable survival outcomes and locoregional control rates. Literature would suggest that OSCC in the young with no history of tobacco exposure is an increasingly common trend in the Indian subcontinent. When appropriately treated with adjuvant, this cohort has excellent survival. PNI is an important prognostic determinant in this cohort and may require treatment escalation. Further study is required to identify potential etiological agents, biological basis, and markers of aggression in this potentially distinct subset of patients. 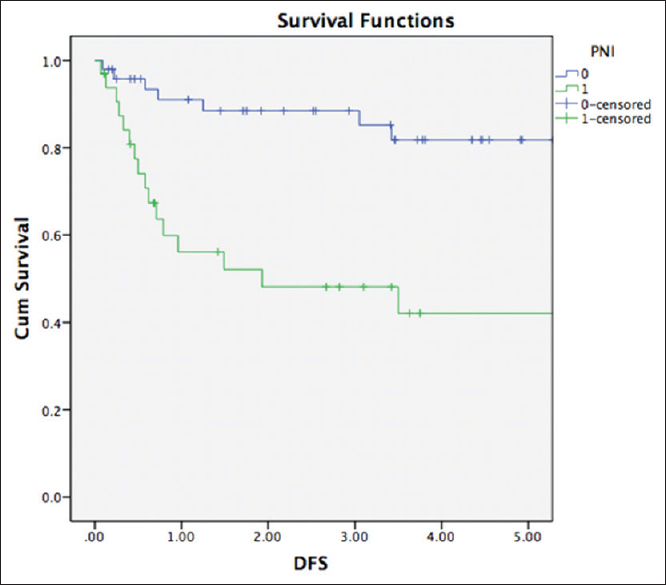 PNI was an independent predictor of overall survival in this cohort and may indicate biological aggression. No further acknowledgments beyond those credited with authorship. Franceschi S, Talamini R, Barra S, Barón AE, Negri E, Bidoli E, et al. Smoking and drinking in relation to cancers of the oral cavity, pharynx, larynx, and esophagus in Northern Italy. Cancer Res 1990;50:6502-7. Maier H, Dietz A, Gewelke U, Heller WD, Weidauer H. Tobacco and alcohol and the risk of head and neck cancer. J Mol Med 1992;70:320-7. Dahlstrom KR, Little JA, Zafereo ME, Lung M, Wei Q, Sturgis EM, et al. Squamous cell carcinoma of the head and neck in never smoker-never drinkers: A descriptive epidemiologic study. Head Neck 2008;30:75-84. Friedlander PL, Schantz SP, Shaha AR, Yu G, Shah JP. Squamous cell carcinoma of the tongue in young patients: A matched-pair analysis. Head Neck 1998;20:363-8. Sasaki T, Moles DR, Imai Y, Speight PM. Clinico-pathological features of squamous cell carcinoma of the oral cavity in patients<40 years of age. J Oral Pathol Med 2005;34:129-33. Siegelmann-Danieli N, Hanlon A, Ridge JA, Padmore R, Fein DA, Langer CJ, et al. Oral tongue cancer in patients less than 45 years old: Institutional experience and comparison with older patients. J Clin Oncol 1998;16:745-53. Schantz SP, Yu GP. Head and neck cancer incidence trends in young Americans, 1973-1997, with a special analysis for tongue cancer. Arch Otolaryngol Head Neck Surg 2002;128:268-74. Amin MB, Greene FL, Edge SB, Compton CC, Gershenwald JE, Brookland RK, et al. The Eighth Edition AJCC Cancer Staging Manual: Continuing to build a bridge from a population-based to a more “personalized” approach to cancer staging. CA: A cancer journal for clinicians. 2017;67:93-9. Annertz K, Anderson H, Biörklund A, Möller T, Kantola S, Mork J, et al. Incidence and survival of squamous cell carcinoma of the tongue in Scandinavia, with special reference to young adults. Int J Cancer 2002;101:95-9. Shemen LJ, Klotz J, Schottenfeld D, Strong EW. Increase of tongue cancer in young men. JAMA 1984;252:1857. Wennerberg J, Anderson H, Biörklund A, Möller T. Carcinoma of the oral tongue in young adults. Head Neck 1994;16:480. Balaram P, Sridhar H, Rajkumar T, Vaccarella S, Herrero R, Nandakumar A, et al. Oral cancer in Southern India: The influence of smoking, drinking, paan-chewing and oral hygiene. Int J Cancer 2002;98:440-5. Madani AH, Jahromi AS, Madhurima D, Debanshu B. Risk assessment of tobacco types and oral cancer. American Journal of Pharmacology and Toxicology 2010;5:9-13. Chen JK, Eisenberg E, Krutchkoff DJ, Katz RV. Changing trends in oral cancer in the United States, 1935 to 1985: A Connecticut study. J Oral Maxillofac Surg 1991;49:1152-8. Cloos J, Spitz MR, Schantz SP, Hsu TC, Zhang ZF, Tobi H, et al. Genetic susceptibility to head and neck squamous cell carcinoma. J Natl Cancer Inst 1996;88:530-5. Scully C, Field JK, Tanzawa H. Genetic aberrations in oral or head and neck squamous cell carcinoma (SCCHN): 1. Carcinogen metabolism, DNA repair and cell cycle control. Oral Oncol 2000;36:256-63. Depue RH. Rising mortality from cancer of the tongue in young white males. N Engl J Med 1986;315:647. Sarkaria JN, Harari PM. Oral tongue cancer in young adults less than 40 years of age: Rationale for aggressive therapy. Head Neck 1994;16:107-11. Byers RM. Squamous cell carcinoma of the oral tongue in patients less than thirty years of age. Am J Surg 1975;130:475-8. Clarke RW, Stell PM. Squamous carcinoma of the head and neck in the young adult. Clin Otolaryngol Allied Sci 1992;17:18-23. Funk GF, Karnell LH, Robinson RA, Zhen WK, Trask DK, Hoffman HT, et al. Presentation, treatment, and outcome of oral cavity cancer: A national cancer data base report. Head Neck 2002;24:165-80. Wey PD, Lotz MJ, Triedman LJ. Oral cancer in women nonusers of tobacco and alcohol. Cancer 1987;60:1644-50. Mork J, Møller B, Glattre E. Familial risk in head and neck squamous cell carcinoma diagnosed before the age of 45: A population-based study. Oral Oncol 1999;35:360-7. Muscat JE, Richie JP Jr., Thompson S, Wynder EL. Gender differences in smoking and risk for oral cancer. Cancer Res 1996;56:5192-7. Jayalekshmi PA, Gangadharan P, Akiba S, Nair RR, Tsuji M, Rajan B, et al. Tobacco chewing and female oral cavity cancer risk in Karunagappally cohort, India. Br J Cancer 2009;100:848-52. Nandakumar A, Thimmasetty KT, Sreeramareddy NM, Venugopal TC, Rajanna, Vinutha AT, et al. Apopulation-based case-control investigation on cancers of the oral cavity in Bangalore, India. Br J Cancer 1990;62:847-51. Krishnamurthy A, Ramshankar V. Early stage oral tongue cancer among non-tobacco users – An increasing trend observed in a South Indian patient population presenting at a single centre. Asian Pac J Cancer Prev 2013;14:5061-5. Bhawna G. Burden of smoked and smokeless tobacco consumption in India – Results from the global adult tobacco survey India (GATS-India) - 2009-201. Asian Pac J Cancer Prev 2013;14:3323-9.
van Dijk BA, Brands MT, Geurts SM, Merkx MA, Roodenburg JL. Trends in oral cavity cancer incidence, mortality, survival and treatment in the Netherlands. Int J Cancer 2016;139:574-83. Liu F, Chen F, Huang J, Yan L, Liu F, Wu J, et al. 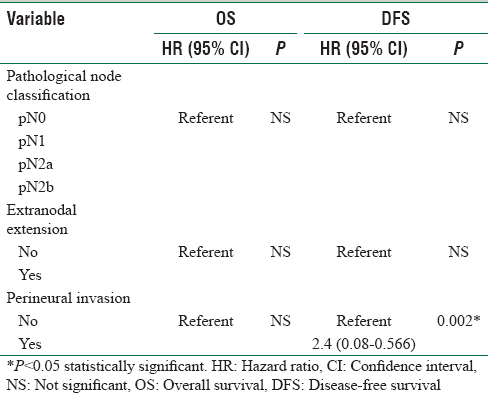 Prospective study on factors affecting the prognosis of oral cancer in a Chinese population. Oncotarget 2017;8:4352-9. Fried D, Mullins B, Weissler M, Shores C, Zanation A, Hackman T, et al. Prognostic significance of bone invasion for oral cavity squamous cell carcinoma considered T1/T2 by American joint committee on cancer size criteria. Head Neck 2014;36:776-81. Piemonte ED, Lazos JP, Brunotto M. Relationship between chronic trauma of the oral mucosa, oral potentially malignant disorders and oral cancer. J Oral Pathol Med 2010;39:513-7. Westra WH. The changing face of head and neck cancer in the 21st century: The impact of HPV on the epidemiology and pathology of oral cancer. Head Neck Pathol 2009;3:78-81. Herrero R, Castellsagué X, Pawlita M, Lissowska J, Kee F, Balaram P, et al. Human papillomavirus and oral cancer: The international agency for research on cancer multicenter study. J Natl Cancer Inst 2003;95:1772-83. Schildt EB, Eriksson M, Hardell L, Magnuson A. Occupational exposures as risk factors for oral cancer evaluated in a Swedish case-control study. Oncol Rep 1999;6:317-20. Sturgis EM, Pytynia KB. After the smoke clears: Environmental and occupational risks for carcinoma of the upper aerodigestive tract. Cancer J 2005;11:96-103. Woolgar JA, Rogers SN, Lowe D, Brown JS, Vaughan ED. Cervical lymph node metastasis in oral cancer: The importance of even microscopic extracapsular spread. Oral Oncol 2003;39:130-7. Shaw RJ, Lowe D, Woolgar JA, Brown JS, Vaughan ED, Evans C, et al. Extracapsular spread in oral squamous cell carcinoma. Head Neck 2010;32:714-22. Mermod M, Tolstonog G, Simon C, Monnier Y. Extracapsular spread in head and neck squamous cell carcinoma: A systematic review and meta-analysis. Oral Oncol 2016;62:60-71.